For applications that require exceptionally strong magnets for holding, separating and lifting, rare earth magnets are by far the most effective type of magnet. Rare Earth Magnets – Master Magnetics, Inc. 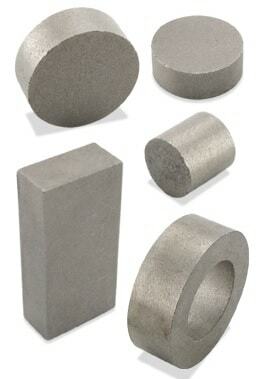 There are two main types of rare earth magnets: neodymium magnets, which are composites of the rare earth element neodymium, iron and boron; and samarium magnets, which are composited from cobalt and rare earth element samarium. Neodymium magnets are both stronger and more affordable than samarium cobalt magnets and are therefore more widely used. Rare earth elements are also called lanthanoids and are found within certain types of oxide-rich minerals within the Earth’s crust. Lanthanoid elements have partially filled outer f electron shells which are the source of neodymium and samarium’s exceptionally powerful magnetic fields. The relative scarcity of mineral deposits containing neodymium and samarium combines with the long and costly process of extracting rare earth elements from naturally-occurring ores, making neodymium magnets and samarium cobalt magnets costly in comparison to non-rare earth magnets. Electro magnets, alnico magnets and ceramic (ferrite) magnets are used extensively in automotive, medical, industrial and aerospace applications; rare earth magnets do the work that weaker ferrite and alnico magnets cannot. Applications for neodymium and samarium magnets are almost limitless, and their functions are often more complex than their weaker relatives. However, magnetic permanence under conditions such as vibration, corrosion, electric fields and heat is a crucial factor for magnets used in industrial, automotive and medical equipment, and although neodymium composites have good magnetic permanence under most conditions, they lose their magnetism under corrosion and relatively low temperatures (200 degrees Celsius). In addition, aside from ordinary physical work such as holding, lifting and separating, rare earth magnets are crucial components in electric motors, servo motors, DC brushless motors, wind turbines, TV monitors, welding equipment, power meters, engine timing systems, ignition timing systems, linear actuators, sensors, vending machines and other equipment. Recently, the rare earth magnet industry has seen a sharp rise since eare earth magnets – mainly neodymium magnets – are crucial in most electric motors, and concern has already been raised regarding lanthanoid ore shortages. With looming petroleum shortages, rare earth magnets are rising as a potential part of alternative energy solutions. 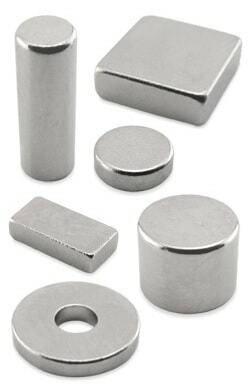 Rare Earth Magnets A rare earth magnet is a type of high-strength permanent magnet that is formed from rare earth element alloys, which are derived from a collection of seventeen chemical elements of the periodic table.